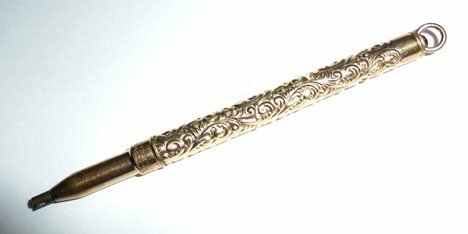 Lovely, fancy 1920s fancy Victorian repoussed lady's mechanical pencil for a sewing chatelaine, necklace pendant or pocket watch fob. Never monogrammed. Made by Keene of New York and in excellent condition. It has a twist mechanism whereby the lead protracts and retracts when you turn the repoussed top. 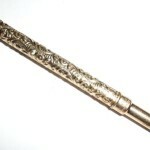 Size is 3 1/8″ long including the loop bail at the top. 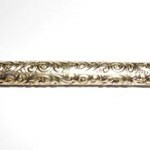 It has thick lead and was likely originally intended for marking fabric or labels. 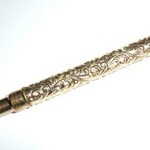 From a bygone era of long ago this is one of those exquisite items made exclusively for women. This is a big chunky vintage sterling silver US Navy mens ring in excellent ready to wear condition. 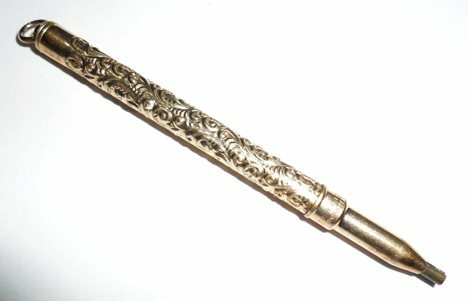 Marked sterling with letter and arrows hallmark. It is freshly polished with a brand new hand cut blue lapis stone that looks great. Ring size is 8 1/2. The top measures 3/4" North to South by 5/8" East to West across the oval. Weight is 11.1 grams. 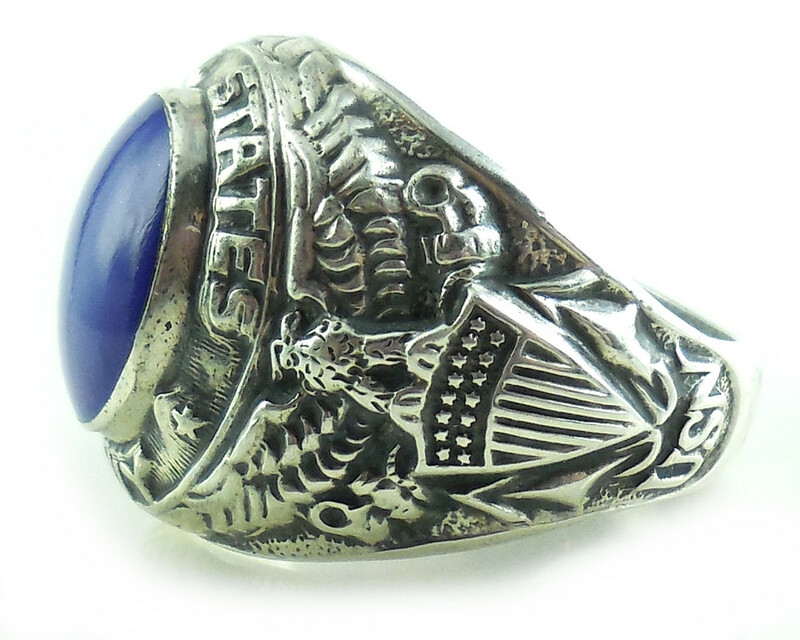 This is a beautiful vintage ring for any US Military collector. Antique Victorian 14K Gold Banded Agate Mens Ring Size Large - This is a lovely, all original, antique Victorian 1880s natural banded agate mens ring in solid 14K yellow gold. It is hallmarked/punchmarked 14 (see photos) and has a solid back except for light to pass through the stone. It is also jeweler tested and Guaranteed solid 14K yellow gold. The agate gemstone on this one is gorgeous. It has carnelian color on the back and milky blue color on top. 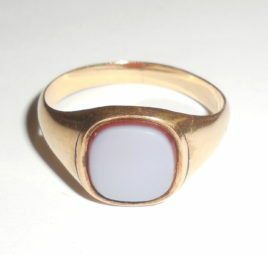 When it is on the finger the light blue color looks solid with a carnelian red brown border. When off the finger you can actually see the red brown through the blue top. It is an unusually pretty piece of natural mined agate. Size of gemstone is 11mm by 10mm. Ring size is 11.25. Weight is 5.8 grams. Condition is original, gently used. It has an old prior resize that is still secure. Good stone. No dents or dings. No deep scratches, tears or wearing down of the gold. The bottom of the band is still just over 3mm wide across. Any age wear is minor and consists of only a few light surface age scuffs that don't detract and are not eye obvious when the ring is worn on the finger. No chips, scratches, cracks or abrasions to the original Victorian stone. This is a lovely mens estate ring for your antique and Victorian gold jewelry collection. Metal: Solid 14K yellow gold Marking: Punchmarked 14, also tested and Guaranteed solid 14K gold. Gemstone: Banded agate Gemstone Color: Red/Brown to Light Blue Gemstone Size: 11m by 10mm Ring Size: 11.25 Weight: 5.8 grams Condition: Excellent, gently used. 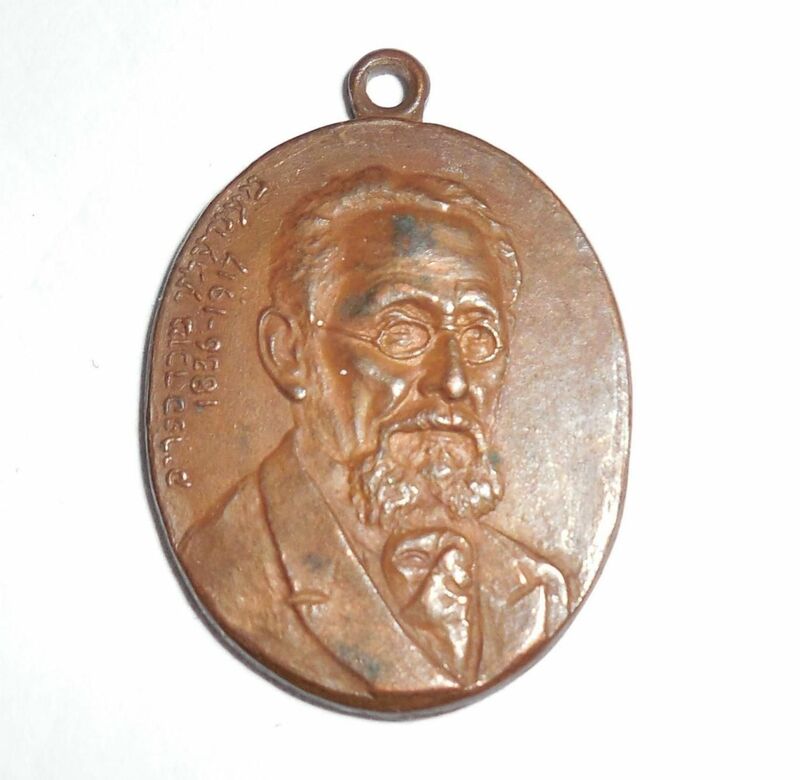 This is an antique mid to late 1800s Victorian Era Judaica pendant, medal, fob of Mendele Mocher (Moykher) Sforim also known as Shalom Jacob Abromovich, the "Grandfather of Yiddish Literature." He coined many words in Hebrew and his works are well-known today. He passed away in 1917. 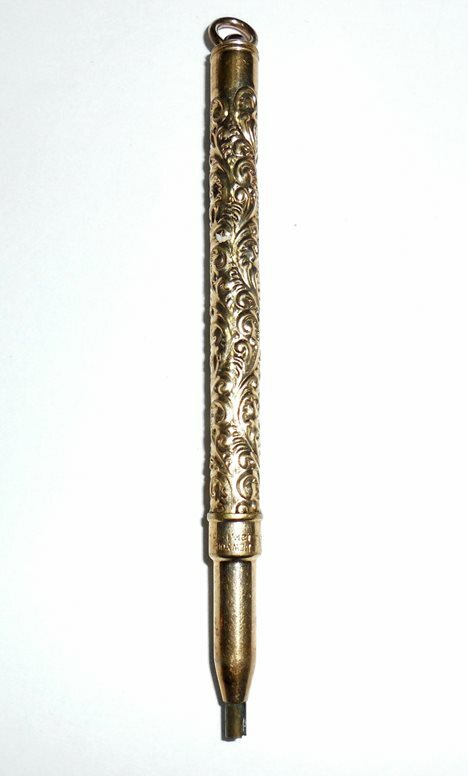 This pendant medal or fob is from an estate and looks like solid bronze. It is made of 1 piece and is still in excellent condition. It has quite a bit of dark patina from age and has not been polished out. Looks like bronze. A lovely literary estate item for your antique Judaica collection. 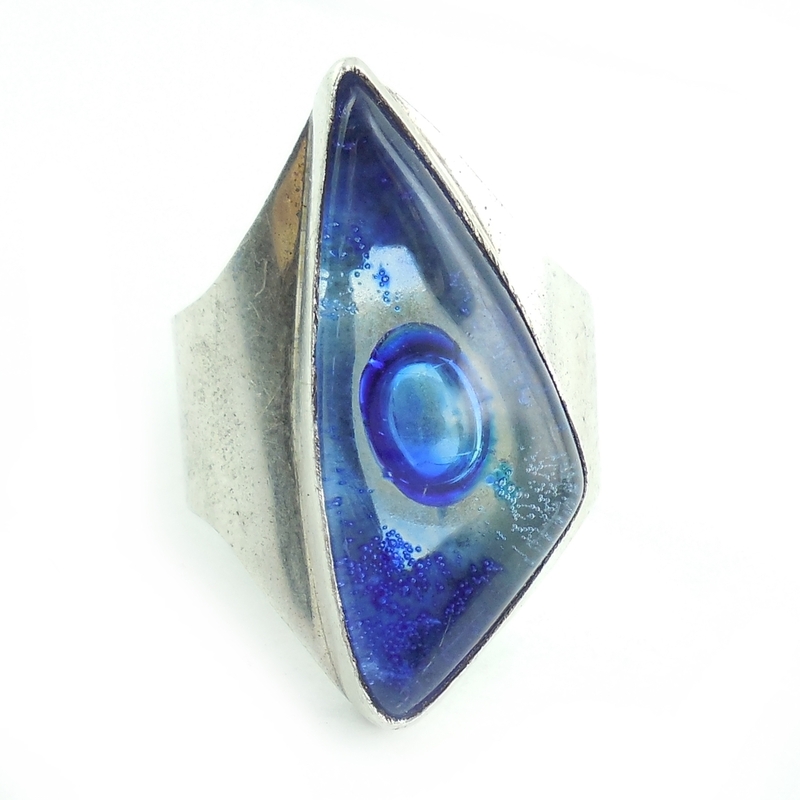 This is a very large 1970s mid century modernist sterling silver ring with a very long amorphic blue translucent acrylic center and a wide cigar band. Hand made and marked 925. Ring size is 9 1/2 and is adjustable for larger sizes. The top measures 1 1/4" long North to South. Condition is excellent having minor wear the sterling. The acrylic center has a slight wobble but seems to be securely set. For men or women this is a showy modernist ring for your vintage plastics and sterling mid century jewelry collection.